L'offre gratuite du jour pour DoYourData Uninstaller Pro 3.0 était valable le 8 juin 2017! 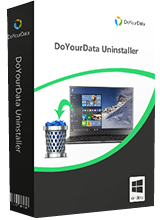 DoYourData Uninstaller Pro offre une solution complète aux utilisateurs Windows pour désinstaller complètement les programmes, les applications Windows et les plug-ins de l'ordinateur. Il va désinstaller les programmes sélectionnés et nettoyer complètement tous les restes tels les fichiers d'ordure du programme, le registre, les journaux, les caches, etc. NB: les données d'enregistrement se trouvent dans le fichier Readme. Installed no problems in Windows 10 tried the programme and after uninstalling a programme iobit uninstaller opened and found residue left behind by this programme. Tried it again but this time uninstalling 4 unwanted programmes and it kept stopping so I opened it again and the same thing happened tried a further 3 times same thing kept sopping working so I will uninstall and stick with my trusty iobit uninstaller. Is this software able to remove leftovers after programs which I have uninstalled already? Installed perfectly and registered with one click. I have an old Data file left over from an older version of Kerish Doctor. iObit Un-installed and Wise care 365 wouldn't un-install it because neither program would let me navigate to where that file was: C: Program Data/Data. It's too late to install the new version of Kerish Doctor given away here a few weeks ago, but that Data file is on my last nerve. Thank you, GOAD. Installed on windows 10....tried to start program and logo shows briefly and then it disappears and the program apparently just closes itself. Strange.....I uninstalled.